When I got to Boston, I found that Lone Star is only sold in the bottle. Now maybe I missed something along the way, but I had never seen Lone Star in a bottle. It seems so much classier – and it definitely stays fresher longer in bottle form. However, it just threw me for a loop the first time I experienced it. Thank goodness we get Lone Star though, since you can’t get Shiner up here (don’t even get me started on that). About a month ago, I got an e-mail from a friend asking me what Frito Pie was, as a friend tried to explain it to her and she was baffled. Of course, I confirmed the existence of the amazingly delicious treat, and upon asking around, found that East Coasters don’t know what the dish is. Seriously, friends. You’re missing out. For those who are not aware, Frito Pie is a bed of Fritos with chili and cheese poured on top. It’s commonly found at sporting events especially high school football games. 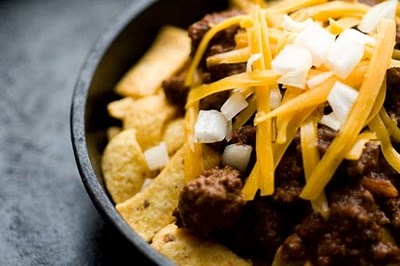 One of my favorite Texas bloggers, the Homesick Texan, has a great recipe for Frito Pie. I’m copying the link to her blog to give this dish true justice, as I don’t know if I can really describe it in words. What do you call a soda pop? You know, the fizzy water with sugar and other flavors in it? Well, in New England, you probably call it soda. If you say soda anywhere around the country, you’ll be universally understood. However, as most Texans know, the word “coke” describes the same thing. Coca-Cola is a product made in the South, and the generic term for a soda in Texas is coke. So essentially, you can order a coke at most establishments in Texas and they will ask you what kind. I say most places, because I can’t guarantee that it’ll happen but it does happen a lot. Or it’s used in conversation. Now in the Midwest, it’s called “pop.” My entire family says pop – and I’ve had to explain to guests or new visitors to the area what that means. It’s not that people in the Midwest don’t know what soda is, they just prefer to say pop. There is actually a running project called Pop v Soda, which tracks what regions say each particular phrase. It’s fantastic, and I’ve included the infographic below (which appeared on the blog FoodBeast) to give you an idea of where people say what term. There are always more phrases or items that truly stand out to me – and remind me, I’m not a native New Englander. However, I’m absolutely rooting for the Pats in the Super Bowl. I might not be from here but I can definitely jump on board the Brady train. If you have experienced culture shock in New England, or are curious about understanding the Southern/Midwestern variety, tell me about it below! This entry was posted on Friday, January 27th, 2012 at 6:57 pm	and tagged with coke, culture shock, frito pie, homesick texan, lone star, pop, shiner, soda and posted in Random. You can follow any responses to this entry through the RSS 2.0 feed. Chicken fried steak!!! These people don’t know what it is, and I’m not even in New England. I’m in DC! Ridiculous. Hello, it’s delicious cube steak dipped in batter and fried, then covered in gravy. Also, don’t get me started on the lack of Tex Mex and chicken/biscuit restaurants up here. There’s not a single place around here that serves just biscuits, gravy, fries, and chicken. WTF? I will commend the impressive food variety – I’ve got Thai, Ethiopian, Indian, burgers, Italian, and even a Dunkin Donuts within walking distance from my house. I found that tonic is also used for soda in New England. I think it’s especially popular in French-Canadian circles.